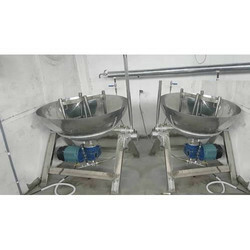 Backed by rich experience in this domain, we are the leading manufacturers, suppliers, exporters and distributors indulged in planting Khoya Making Machine. These plants manufactured by employing advanced technology and latest machines. Our highly experienced professionals and hard working employees use excellent quality material in the production process that is sourced from vendors of high repute. Post-manufacturing, these products are inspected on industrial parameters of quality to ensure flawlessness. We are instrumental in offering an excellent specimen of Industrial Mava Making Machine to the esteemed customers. The entire plant offered by us is fabricated under the supervision of our quality controllers, in compliance with the international quality standards. These products employed can also be customized as per the exact details and specifications by the esteemed clients. Looking for Mava Making Machines ?